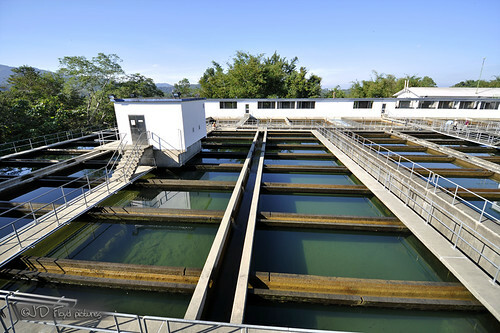 The Association of Water and Energy Research Malaysia (AWER) carried out a non-revenue water (NRW) study in Malaysia and said that more than 1/3 of water treated at our plants is WASTED. National water loss averages were 36.6% in 2009 and 36.4% in 2010. 2011 - could well surpass Johor; RM200million. Wait & see! 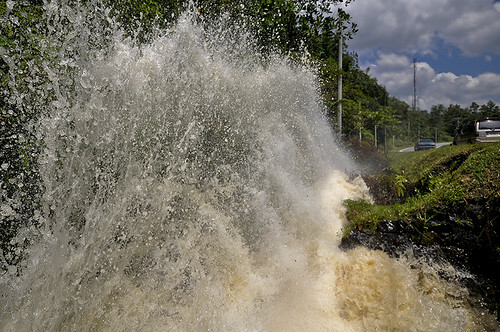 Sabah's largest waterworks (WTP) located in Penampang is designed for production of 165 million liter (MLD) of water per day and at overload mode it can go up to 180 - 190 MLD. If the estimates by AWER is taken at face value, i.e. 195 million m3 water loss in 2010, we are talking about 3 WTPs of this size. Solve 30% of our NRW volume and we DO NOT need to construct any dam in Kaiduan for the foreseeable future. By reducing NRW, we are tackling several tricky issues namely - avoid destruction of greenery in Kaiduan Penampang, avoid relocating people from their ancestral lands, and patch a hole in the treasurer's pocket. It is pointless to keep building new Water Treatment Plants to increase production but at the same time loss half of the treated water along the transmission and distribution pipes. Set the NRW reduction target. A detailed one if needed be. Specify reasonable time frame. Speaking of which, 5 years is not reasonable at all! Prepare technical guidelines. Let the engineers work it out. Work out capital and operational expenditures. Who says engineers and accountants can't agree on figures! Check and analyse the plans. The accountants say 'audit', we say 'assess'. People's participation. Let the public know about it and provide avenue for feedback. There is a popular Malay saying "CAKAP TIDAK SERUPA BIKIN" or easier said than done. Of course, addressing the NRW issue will never be an easy task. But if we don't start somewhere, when will we ever get to the finish line? Whoa.. but if we're counting on area coverage of there matters, Sabah should do fine.. But hell yeah, the Sarawak is more bigger and yet, they aren't in the top 5 either.. Ok yeah.. ^_^.v..
@Meitzeu. It has been bad and it'll continue to be so unless someone up there take the bold move and start doing the housekeeping, first and foremost. @Aki. If we are to look at percentage of NRW, some quarters claimed (although not a qualified statement) that Sabah is the highest! Now, that's a headline for the wrong reason! negeri sembilan tak termasuk ke??? @MaryaYusof. It's more of political will now, as economists, accountants, engineers can only give you fundamental facts n figures. But, yes, where there is a will there is a way. @Elih Japahar. Cukup utk buat/tar beberapa jlnraya di daerah saya dan anda.